A gang of Bosmer thieves has been causing some problems around Anvil. Receive the quest details from Azzan. Discuss the contract with Maglir. Speak with Newheim the Portly to receive additional details and an optional mini-quest. Kill the thieves in Hrota Cave and (optionally) retrieve Newheim's Heirloom. Return to Azzan and Newheim for your rewards. You can receive this contract from Azzan in the Anvil Fighters Guild after you've done a few jobs for Modryn Oreyn in Chorrol. He'll ask you to look for a den of thieves that has been responsible for a recent spate of thefts in the area, referencing your past contract to help Norbert Lelles: "Good to see you're working hard. I've got some more thieves for you to deal with in Anvil. There have been a number of thefts in the area, and witnesses believe the thieves are holed up nearby. Check around, and see what you can learn." Azzan pairs you up for this mission with Maglir, whom you met recently on a past contract: "I'm not sure the numbers you'll be dealing with, so I'm sending you with another new recruit. Maglir. I believe you two have already met." Once he dismisses you with "Get moving. You need to get rid of those thieves." you just need to take a few steps around the building. Maglir should be somewhere in the Anvil guild hall. He will be less than thrilled to work with you again regardless of your past choice to rat him out or not. Nevertheless, he'll offer some advice (and of course a complaint): "Oh, it's you. Looks like we're working together. Sounds like we need to ask around Anvil for any clues. Figures we'd get a mission without any real direction. I'll follow you." From this point on you can order him to follow you or wait for you to return. Speak to one of the townsfolk or guards about Thieves; you can even ask someone else in the guild hall if you don't feel like chasing down an Anvil citizen outside. If their disposition towards you is 60 or above they will tell you to speak with Newheim the Portly, a recent victim of the thievery. Newheim can be found at home or wandering around town. When you find him, he'll confirm his knowledge of the thieves and provide their whereabouts: "Aye. I know about those scum. Rotten bastards robbed me blind, they did. Stole a family heirloom. Bunch of Bosmer, if you can believe it! No offense to your friend, of course. Last I heard, they were holed up in Hrota Cave, not too far from here." He'll point you towards the cave by saying, "You'll find it north of Anvil. Good luck, and give it to those bastards good." Maglir will confirm your new goal: "Sounds like we'll find the bandits in Hrota Cave." If you weren't already sure where you were going. Newheim will also mention a family heirloom that was stolen, a flagon, and says he'll reward you if you can return it. This is an entirely separate quest in your journal labeled Newheim's Flagon. You must speak to Newheim selecting the subject Heirloom for the flagon to appear in the cave; be sure you've heard the words "Took my flagon, they did! Passed down to me from my father Rulf, and from his father Torbalt. It's a wondrous cup. Keeps ale cold and sweet. Been drinking from a lousy wooden tankard since. It's just not the same. If you can find it, you'd have the gratitude of Newheim the Portly!" If you find his flagon, you can return it to him for a reward of three bottles of Newheim's Special Brew. Head to the cave, and keep in mind you have Maglir trying to follow you (and encouraging you: "Let's get rid of these guys, so we can get paid." and "Payday! Let's roll."). It is impossible to actually lose him, but he could be a long way back. There are eight thieves in the cave - Cingaer, Dennilwen, Githriian, Idrolian, Nedhelfin, Niraegaer, Thiirchel, and Thrangirfin; their respective pages have tips for defeating them. If you are a stealth-based character, you will want to leave Maglir at the cave entrance. Make your way through the cave with or without him and kill the thieves; you will need to get them all for the quest to update. Take care of the tripwire in the hallway before the last room. 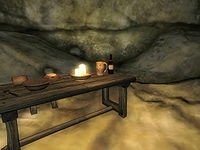 Newheim's Heirloom is on a table in the east end of the cave, in the pit in the center of the largest chamber. You'll receive a quest message when all the thieves are dead, as well as when the flagon is found (for the appropriate quest). Maglir will also confirm the quest being near completion: "We're done here. Let's go get paid." and "It's tavern time!" Head back to Azzan once the job is done for a standard level-dependent gold reward and one Fame point. If you have already completed Amelion's Debt, Azzan will also be willing to promote you to the rank of Protector. You will then have to go to Modryn Oreyn in Chorrol for your next quest, The Master's Son. Otherwise, you will first need to go to Burz gro-Khash in Cheydinhal to complete Amelion's Debt next. Azzan may fail to give the quest when spoken to. ? 10 Azzan has given me a contract to find the lair of some thieves near Anvil. I am to travel with another fairly new recruit, Maglir. I should go to Anvil first and see what information I can learn about the thieves. 20 People in Anvil have suggested I speak with Newheim the Portly. He apparently had some goods stolen by the thieves. 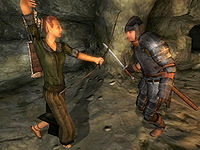 24 Newheim has told me that the thieves are all Bosmer and may be located in Hrota Cave, north of the city of Anvil. Maglir and I should travel there and take care of them. 30 Maglir and I have succeeded in clearing Hrota Cave of all of the thieves living there. I should return to Azzan for payment of the contract. 100 Finishes quest Azzan was pleased with our efforts, and has paid the contract. 22 Newheim has mentioned that he had a family heirloom, a pewter flagon, stolen by the thieves. If I return it to him, he'll reward me. 33 I have found Newheim the Portly's flagon. I should return it to him. 95 Finishes quest I've returned Newheim's Flagon to the Nord, who was pleased to have the heirloom returned. He rewarded me with three bottles of his own special brew. It is possible to use the console to advance through the quest by entering setstage FGC03Thieves stage, where stage is the number of the stage you wish to complete. It is not possible to un-complete (i.e. go back) quest stages. See SetStage for more information. This page was last modified on 21 August 2017, at 05:12.